"The world's most beautifully proportioned cars! ", was how Ford was promoting the new 1959 models. This Galaxie Sunliner convertible certainly lives up to that description, in a year that was probably full of the greatest automobile excesses, Ford had shown remarkable restraint. 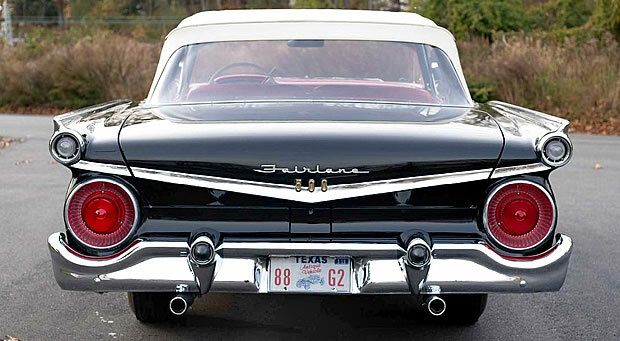 Their cars got a complete restyle for 1959 and, as was becoming the practice, received Thunderbird influenced styling once more. Ford ornaments sat atop of the new, flattened front fenders with a correspondingly flat hood. The bumper and grille assembly was revised with the latter featuring four rows of floating stars. It was a look that was somewhat reminiscent of what Buick had done preceding year. 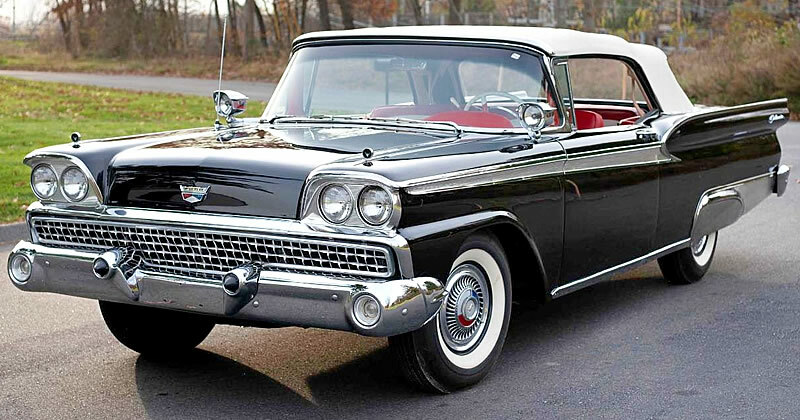 The Sunliner, just like the Skyliner, actually started the '59 model year as a Fairlane 500. Shortly after the Galaxie series was launched as the new top-of-the-line and the Sunliner and Skyliner then became Galaxies. Earlier cars will therefore have a Fairlane 500 script on the rear quarter and Galaxie once things changed. Interestingly, even after the name change, they still retained Fairlane 500 script on the trunk lid. 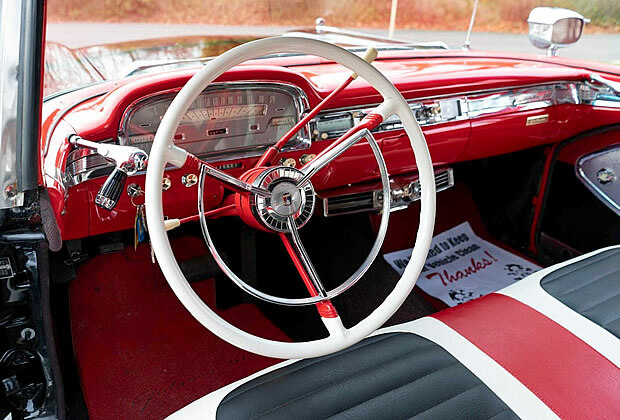 The tri-color red, black and white interior color scheme on this Sunliner look great with the Raven Black paint. Thirteen paint colors (plus two tone options) were available for 1959. Inside we see the redesigned for '59 instrument panel with the new, flattened speedometer. We can also see the original owner of this Sunliner opted to purchase A MagicAire heater / defroster and AM radio costing $75 and $59 respectively. 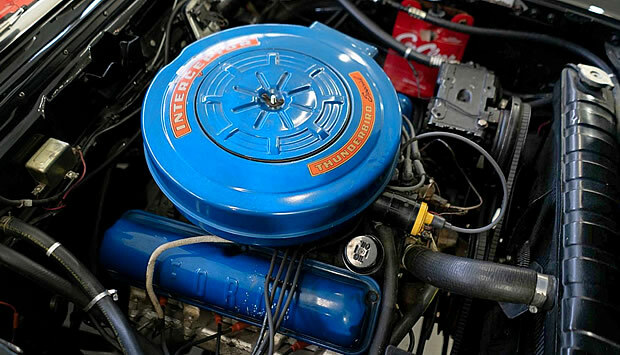 For an extra $118 you got the 292 cubic inch Thunderbird V8 engine rather than the standard 223 cubic inch Mileage Maker 6 cylinder engine. For $167 you got the 300 horsepower, 352 cubic inch Thunderbird Special V8 that is in this car. All came standard with a 3-speed manual transmission. This Sunliner is also fitted with a Cruise-O-Matic automatic transmission costing $231. There was also another automatic transmission available- the Ford-O-Matic coming in at $190. Ford sold 45,868 Sunliners during the 1959 model year. Prices started at $2,839 for the six cylinder version. 1959 was a great year for Ford with sales up over 45% over the 1958 figures and got very close to knocking Chevrolet off of the number one spot. It's not surprising as Ford had, arguably, produced one of the finest looking cars in their history. In addition to the options mentioned above, this car also benefits from factory air conditioning and power steering.